Heavener International Case Competition (HICC) is an undergraduate business case competition hosted by the University of Florida in Gainesville, Florida, the United States. There are 20 universities from around the world participating, in a week event from February 11-17, 2018 and competing to solve real-world business cases. The representatives for Thammasat University at this year�s HICC 2018, were four BBA#23 students: Araya Thongteeraparp, Atis Srisa-a, Jun Meckhayai, and Wichayut Woodtikarn. Our journey began with long flights which took us almost a day to travel from Bangkok to our destination, Gainesville, Florida. Before the case cracking begins, there were several fun social activities for us such as learning school spirit or the �Gators�, tailgate, and shopping. The come the most fun part- case cracking. We had to compete in two rounds of case cracking, where, this year, HICC has added more challenge to the competition by introducing new format of presentation to both of the cases. The first case was a 5-hour case that we have to prepare one placement paper and 20 back-up slides. Here, we get the opportunity to present the placemat for 5 minutes followed by 20 minutes Q&A session. The case company is Study Edge, an educational platform provider to mainly students at the University of Florida. The company is expected to launch new product nationwide. Hence, it seeks for the best go- to- market strategy. For this round, the team came 1st in the division. On February 14th, before the second round begins, the organizing committee took us all to Walt Disney World in Orlando for a day of relaxation and fun. The parks were full of people and of course, we all had a magical day at Disney! After all of the fun, it�s now time for the second round, which is a 30-hour case. Despite the long length of time we have for case cracking, we only get 10 minutes to present our solutions with 15 minutes Q&A session. The case company is a management and information technology consulting firm, Booz Allen Hamilton. The company wishes to reimagine its onboarding experience for its new recruits. Our team ranked second in the division for this round. However, in terms of the overall score, the team came 1st in the division. Therefore, we proceeded to the final round. 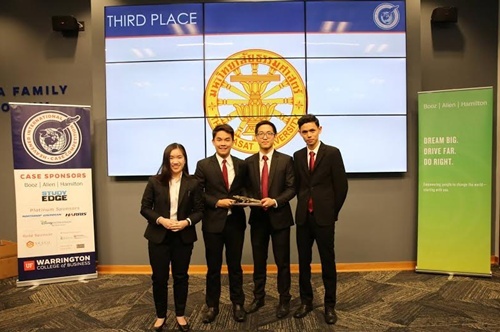 After the long case journey, our team- Thammasat University was announced this year�s HICC 2018 3rd Place winner! None of this would have been possible without all the support we have received. We would like to express our sincere appreciation and gratitude to our advisors, Asst. Prof. Dr. Surat Teerakapibal, BBA Director Dr. Worapong Janyangyuen, Ajarn Supawat Likittanawong, Dr. Nopporn Ruangwanit, and Asst. Prof. Dr. Orapan Yolrabil. As well as to the BBA office, our friends and families. More importantly, thank you BBA Thammasat for giving us this unique and world-class learning opportunity. Posted date: March 19, 2018 by Sochaya T.